Ceever cabins of treatment are available in many standard models. All machines of the serie BIT have a completely air-tight working space, built in stainless steel with the inner surface, which guarantees the optimal brightness. The supporting base of a pickling cabin is built with a sturdy, thick frame, carefully coated. 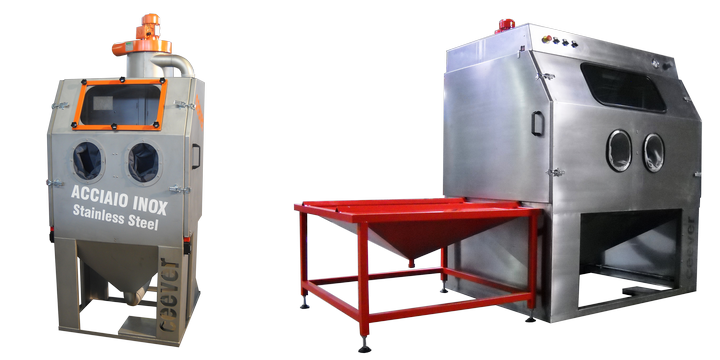 The separation and collection of the used pickling material carried out by the cyclone/centrifugal separator with air balancing, which is connected with an exhaust fan and positioned on the rear side of the machine. The exhaust pickling material, before the further filtering, is to be separated from the reusable materials and conveyed then into a double body bag filter, that is equipped with a slide fastener for a quick and efficient cleaning. The bottom of the cabin is tapered and connected to suction apparatus, which sends the air/sand mix to the separation device. In the front of the cabin, there is the operator position with one or more places. In this area there is also a door to insert or remove the treated materials. Sleeves?, produced of rubber and mounted on the front door of the insert/remove, prevent the escape of material during the pickling operation and allow at the same time a greater freedom of movement for the operator.